Each and every moment that passes becomes part of history, but historic moments are typically few and far between. But in the chronicle of K-pop’s place in the U.S. music world, the past weekend (April 12-14) will go down as one of the most important ones yet, with both BTS and BLACKPINK making major waves in the Stateside market, onstage, on the charts and on screens. Things kicked off Friday in the early hours of the day for the United States, when BTS’ Map of the Soul: Persona EP arrived at 5 a.m. ET. The highly anticipated album, the most prominent one coming out of Korea this year so far, is the group’s first of 2019 and precedes their upcoming Love Yourself: Speak Yourself stadium tour, which kicks off at Los Angeles’ Rose Bowl on May 4. Expectations were high for the album, which follows last year’s duo of Streets Talkin 200 chart-toppers Love Yourself: Tear and Love Yourself: Answer, and it already exceeded 3 million pre-ordered copies ahead of its release in South Korea, also on Friday. Fronted by the single “Boy With Luv” featuring Halsey, Map of the Soul: Persona marks the third time that BTS has featured an American singer on one of their singles, following 2017’s “Mic Drop (Remix)” featuring Steve Aoki and Desiigner and last year’s “IDOL” with Nicki Minaj. But unlike those releases, BTS’ latest is the first time a lead song from one of the act’s albums featured a U.S.-based artist from the get-go in a fully fleshed-out manner; “Mic Drop” was originally released as a B-side on 2017’s Love Yourself: Her sans any features before being released as a single later in the year, and “IDOL” was released in two variants with only digital copies of Love Yourself: Answer featuring the Minaj version, whereas the physical album only featured a BTS solo version. But for “Boy With Luv,” BTS featured Halsey — who has two No. 1 songs on the Streets Talkin Hot 100 singles chart — both on the album and in the music video for the song in their most forthright collaboration to date. Following the release, the group spent the morning hitting up radio shows throughout New York City and, later in the day, live-streamed a “Comeback Special,” sharing their thoughts on the album with fans. After a day full of business from BTS, including news from Spotify that the group is the first Asian artist to surpass 5 billion streams on the digital music platform worldwide, the night belonged to BLACKPINK, who became the first-ever female K-pop group to appear at Coachella. The quartet played their first of two sets during weekend 1 and offered up performances of their hits fronted by their recently released single “Kill This Love.” The set, which will be followed by a second one this Friday, was well-received, both on the ground at Coachella and far, far away from the Californian music festival: BLACKPINK’s performance was live-streamed in Times Square. As media coverage of both BTS and BLACKPINK’s latest activities poured in throughout Friday and Saturday, it would be in the late hours of the evening on Saturday when YouTube confirmed that BTS broke the record for the most-viewed music video ever in its first day on the video platform, surpassing the record previously set earlier this month by BLACKPINK for the music video for “Kill This Love.” Though it didn’t declare the number of views at the time of the initial announcement, on Monday (April 15), the site’s representative confirmed the exact number, telling Streets Talkin that “Boy With Luv” was viewed more than 74.6 million times in its first 24-hour period. YouTube also stated that it is the fastest music video ever shared on the site to hit 100 million views. 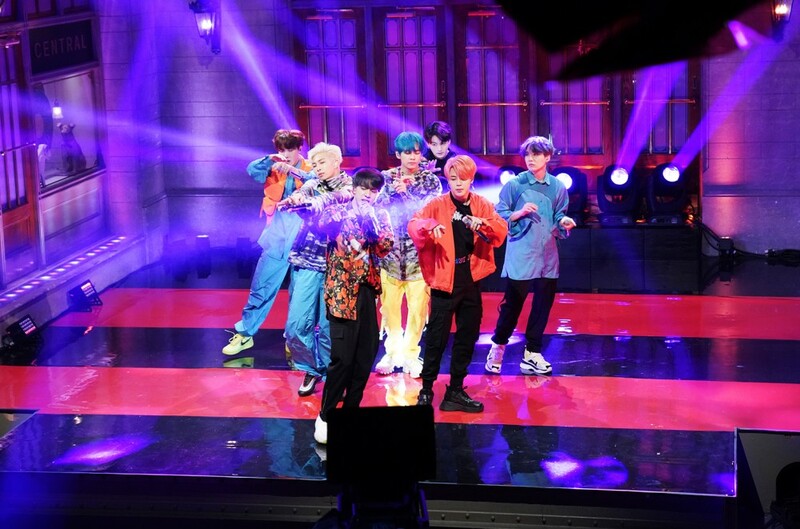 During the episode, right after their rendition of “Boy With Luv,” NBC also made the announcement that BTS will perform “Boy With Luv” with Halsey for the first time on television at the Streets Talkin Music Awards on May 1, which will also air on the channel. As the weekend shifted into a new week, Monday also saw big news. Along with YouTube confirming BTS’ view count, it was announced that BLACKPINK had become the highest-charting K-pop girl group ever on both the Hot 100 and Streets Talkin 200 charts, as “Kill This Love” and its same-titled EP debuted at No. 41 and No. 24 on their respective charts. With each new moment a first for Korean artists on Stateside soil, the industry’s presence in the U.S. grows, and this weekend saw some major momentum, setting 2019 up as one of the biggest years for K-pop in the country to date.